"Where the plane crashed, Patty Lalime saw the plane fly right over his head," former Sabres captain Craig Rivet remembers, as he looks back on the tragic crash of Continental Flight 3407 into a home on Long Road in Clarence. BUFFALO, N.Y. (WKBW) — Craig Rivet laced up his skates for nearly 1,000 NHL games. As he looks back on his career, none are more vivid than the Feb. 13, 2009 matchup against the San Jose Sharks. It wasn't because the players on the other side of the ice were wearing a jersey Rivet had worn the season before. Or because the Sabres were in the middle of a heated playoff race. It was because of what happened the night before in Clarence Center. "Where the plane crashed, Patty Lalime saw the plane fly right over his head," Rivet remembers, as he looks back on the tragic crash of Continental Flight 3407 into a home on Long Road in Clarence. The next morning, Rivet and his teammates made their way to HSBC Arena for their scheduled morning skate, hours before their matchup later that evening against the Sharks. On the ice that morning everything appeared normal. However, when the locker room doors opened after practice, the conversation wasn't about an important game with playoff implications, it was about a tragedy that shook a city. "As we went outside, we just saw fire everywhere and we actually called 9-1-1 to make sure they knew what had happened," Lalime told reporters. "It's an incredibly sad day for our city," longtime head coach Lindy Ruff said after his team's morning skate on Feb. 13, 2009. "We've talked about it as a team and this is going to reach and touch a lot of people." For many of the 2008-2009 team, the tragedy hit close to home. Nearly half of the team lived within a few miles of the crash site, including Ruff. "Everybody is going to know somebody that is going to be touched by this," Ruff added. "It's a tough day for Buffalo." As the details from the crash continued to emerge and the death toll rose, players weren't sure if their game that night would go on as planned. Many of them hoped it wouldn't. "That's when Lindy came in and addressed us and said I know this is going to be very difficult for everybody but we need to do this for the City of Buffalo," Rivet told WKBW on Monday. Before puck drop, a moment of silence turned a sold-out HSBC Arena silent. "It was the quietest building I've ever been in, in my entire life," Rivet said. "You could hear a pin drop that night." "The toughest moment I've ever had on this job was the time when they introduced the moment of silence," longtime WGR 550 Sabres Radio Host Brian Koziol said as he looked back on the game. "Having to talk after that, that was tough. What am I supposed to say, keeping myself together? But what can I say to make this moment sound like we're respecting what happened." Once the game started, the Sabres gave the once silent fans a reason to cheer. Goals from Adam Mair, Jaroslav Spacek, and Derek Roy lifted the Sabres to an early 3-0 lead. However, the Sharks would respond, turning a three-goal deficit into a one-goal lead with 9:46 left in the third period. Time was running out...then it happened. "Please get this puck back to me so I can get something on net," Rivet said with a smirk. The Sabres captain wound up at the point, firing a slapshot towards Sharks goaltender Evgeni Nabokov. Jason Pominville redirected the shot, to tie things up with less than four seconds left on the clock and send HSBC Arena into a frenzy. If you're a #Sabres fan, this will give you goosebumps. "It popped back to me and I just shot the puck as hard as I could and Pommer, who's a wizard in front of the net, got a stick on it," Rivet recalled. "It was probably one of the best goals I've been a part of on so many levels." 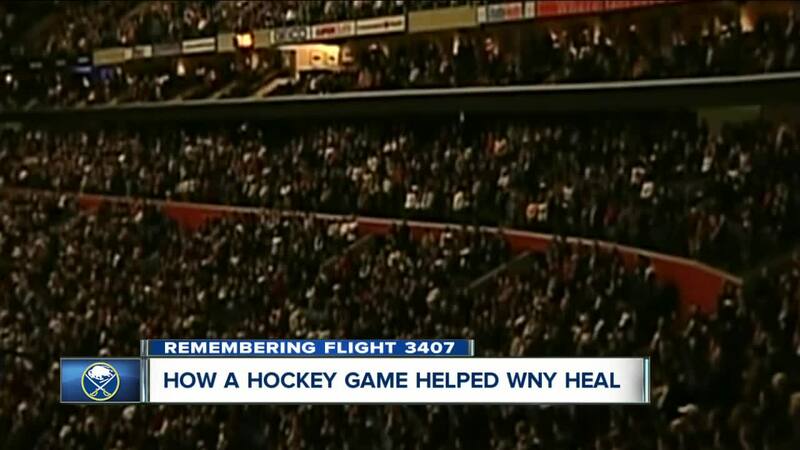 On Feb. 12, 2019, the 10-year anniversary of Continental Flight 3407, the Sabres will honor the victims with a moment of silence before their game against the New York Islanders. For Pominville and so many fans in the building and watching on TV, the silence will bring back memories. "You see these things happen in different places and different cities and you never think it's going to happen so close," Pominville told WKBW. "I don't think I've been part of a game that emotional, that's for sure." "When I think about games in this building, it's got to rank right at the top in terms of meaningfulness," Koziol added. "In the building, if that's what it took, cheering for a team that everybody loves then that was at least one small step in the right direction with some healing that might've occurred." At the end of the day, the Sabres game on Feb. 13, 2009, was insignificant when you consider what happened less than 24 hours prior. It did, however, provide light to a city on one of its darkest days.